Our trip to Philadelphia would not be complete without a visit to see the Liberty Bell. The Liberty Bell, symbolic of our freedom is housed in the Liberty Bell Center. No tickets are required for visitors to see the Liberty Bell up close. Allow ample time to pass through the security checkpoints. Prepare for the weather in Philadelphia as you may wait in line outside the building exposed to the elements. 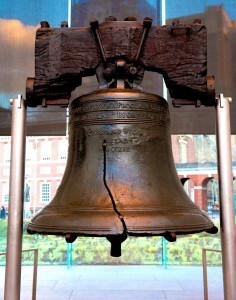 The Liberty Bell is mostly copper mixed with tin, lead and other metals. The large bell is 12 feet in circumference. The Liberty Bell was built in London. The distinctive crack occurred the first time the bell was rung.